USS Silversides was commissioned into the U.S. Navy eight days after Japan's attack on Pearl Harbor. During World War II, the submarine served in the Pacific Fleet along Japan's coasts, in the East China Sea, and through key enemy shipping routes around the Marianas, Carolines, Bismarck Archipelago, and along the Solomons to Guadalcanal. Its mission was to stop raw materials and supplies -- oil, bauxite, rubber, coal, food, and iron ore -- from reaching Japan. Silversides completed 14 war patrols and sank 23 ships, the third highest total of enemy ships sunk by a U.S. submarine during the war. After the war, Silversides served as a reserve training boat near Chicago. Decommissioned in 1969, the vessel was saved from scrapping by the Great Lakes Navy Association in 1972. Virtually unmodified since her last refitting at Pearl Harbor in 1945, Silversides is on display in Pere Marquette Park along the Muskegon Lake Channel. Silversides conducts youth group overnight encampments. 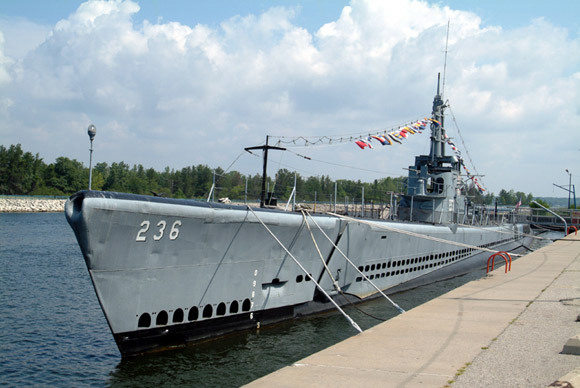 USS Silversides is a National Historic Landmark.